Do you enjoy the work I put into LaxRecords? I’m able to keep the site free to everyone through kind donations from you. I don’t believe in putting this content behind a paywall – it’s not why I started LaxRecords.com. If you have the means, please consider making a donation to help keep the project going. WoodLacrosseSticks.com is the official supplier of LaxRecords.com's Player of the Year trophy. 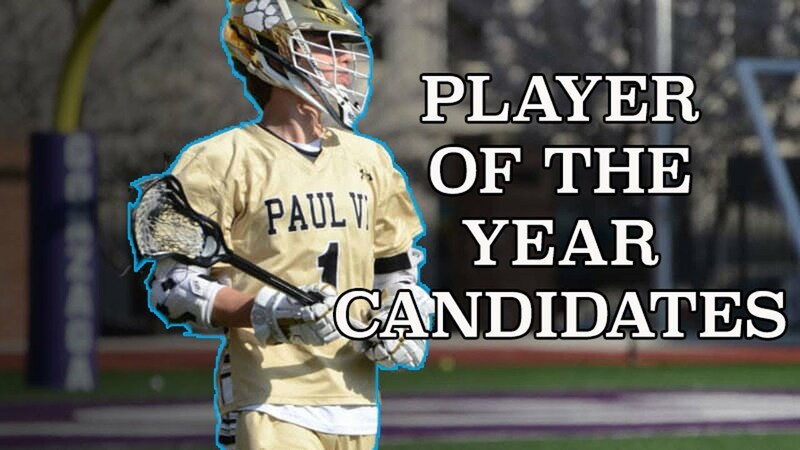 Rather than wait until the end of the 2019 boys’ high school lacrosse season to unveil the Player of the Year and All-LaxRecords.com team, I am publishing a weekly tracker to keep up-to-date with the players currently under consideration. Players will be considered if they fall into the following categories: among the state or county leaders in any statistical category (defenseman and face-off specialists included); the strength of team’s schedule; performance in both regular and postseason games and importance to the team. To submit a player update or to have a player considered for this list, please submit the player’s performance to Mike Loveday. Latest Update: Angelus has 62 points through nine games. He had six points in one half against Good Counsel (Md.). Latest Update: Turns out, Birch is already a member of the #400Club. After conferring with Bob Badders, Managing Editor of Shore Sports Network, Birch had 442 career points on 308 goals and 134 assists. The senior needs 27 points to become New Jersey's all-time scoring leader. Latest Update: Bundy has 69 points this season to push his career total to 355 points. Latest Update: Day surpassed 400 career points with a 10-point game last week. The senior is currently at 408 career points. Latest Update: Through the first three games of the year, Groeninger scored 16 points. He passed 300 career against The Woodlands. Latest Update: O'Neill pushed his season totals to 33 points on 28 goals with another six goals in the last week. two against New Canaan (Conn.) and four against St. Ignatius Prep (Calif.). Latest Update: Shellenberger has 22 points through four games. The Virginia commit missed one of the Saints games. He scored seven points against undefeated Christ School (N.C.). Latest Update: Siracusa is on the cusp of joining the #400Club as the Maryland commit is two points away. Siracusa has 84 points this season after scoring 10 goals in his last two games. He should reach 400 when Centennial takes on North Gwinnett (Ga.) on April 19. Latest Update: Tygh became the nation’s leader for the most career faceoff wins with a 15-for-21 performance against Lawrenceville (N.J.) on Saturday. The Virginia commit has 1,148 career wins to break the record previously held by TD Ierlan. Tygh started the week winning 17 of 19 face-offs to help Penn Charter control the ball and defeat St. Augustine Prep (N.J.) 8-7, which put him close to the record. The senior is winning 71 percent of his opportunities this season and has eight games in which he has won at least 11 face-offs. Latest Update: Backstrom has 38 points through the first five games of 2019 and is now 20 poitns away from 300 for his career. Latest Update: Baro pushed his season point total to 85 with a 10-point game against Trinity Christian (Ga.). The junior is 14 games into his season and averaging 6.1 points per game. Latest Update: Fermo surpassed 300 career faceoff wins last week. He won 13 against Seton Hall Prep (N.J.) and two against West Morris (N.J.) to push his career total to 306. Latest Update: Fries is 12 games into his senior year and is averaging 5.1 points per game. He scored eight points against Lee's Summit North (Kan.). His current career total is 318. Latest Update: Hart pushed his lead of the Colorado save record even further last week. The senior now has 774 career saves nine games into his senior year. Latest Update: Hull is approaching 100 points on the season with 96 points through 12 games. The Michigan commit is also nearing 400 career points with a current total of 359. Latest Update: Malever reached 300 career points earlier this season, and joined the 400 club with five assists against Pace Academy (Ga.) on April 5. The Maryland commit has 116 points on 63 goals and 53 assists this season. Latest Update: Newton scored seven points against Stevenson (Ill.) last week to give him 46 for the year. The senior is seven games into his final season and has 327 career points. Latest Update: Parker has a shot at reaching the #400Club this season. He is at 359 points 11 games into his senior year. Broughton has played 17-to-18 games in each of the last two seasons and Parker is averaing seven points per game this season. Latest Update: Schwartz became North Carolina’s all-time faceoff wins leader with a 10-for-12 game against Garner Magnet (N.C.) on April 12. The Middle Creek (N.C.) senior became the known leader in North Carolina history with 836 career wins. He breaks Peyton Smith’s record of 827.